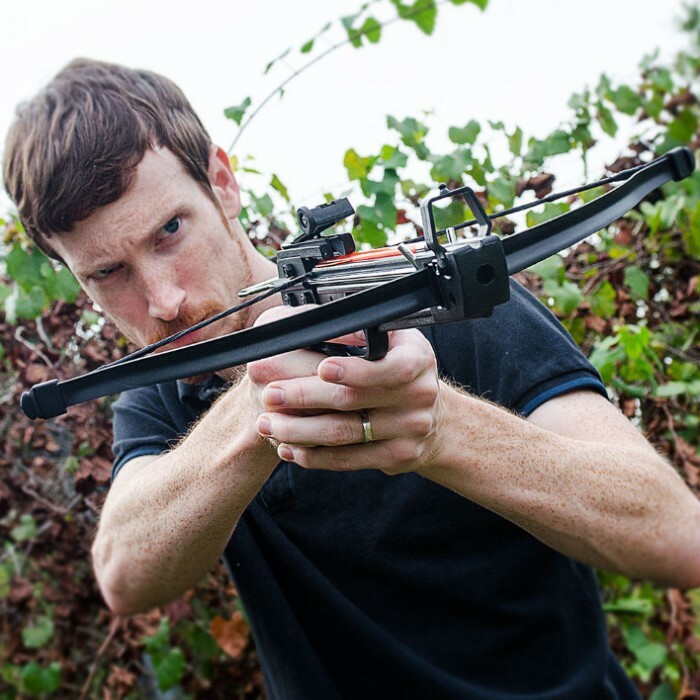 This pistol grip mini crossbow from Avalanche packs a whopping 50-lb. draw weight to it that delivers impressive distances of up to 150 feet per second when you launch the bolts. It's perfect for beginners with an impact-resistant ABS frame and manageable draw weight. 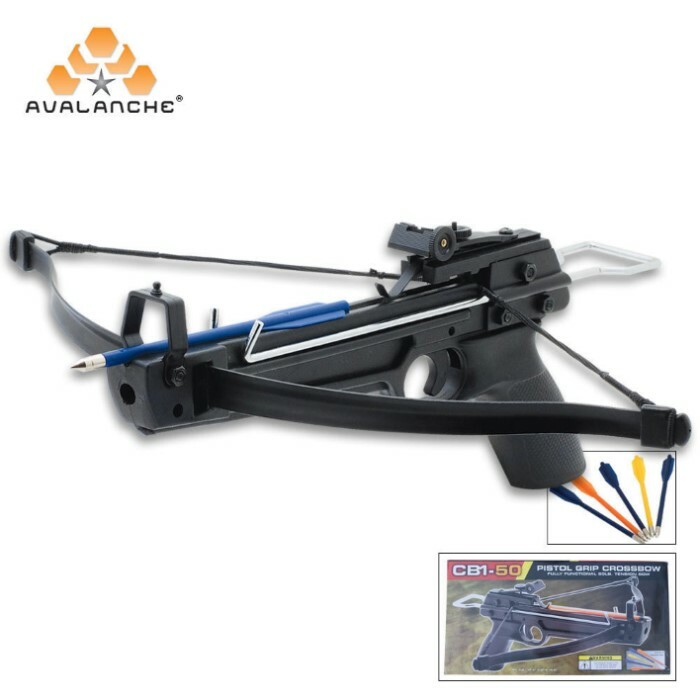 What's also impressive about this mini crossbow are its metal bow limbs and pistol grip style handle. It even offers built-in adjustable sights. 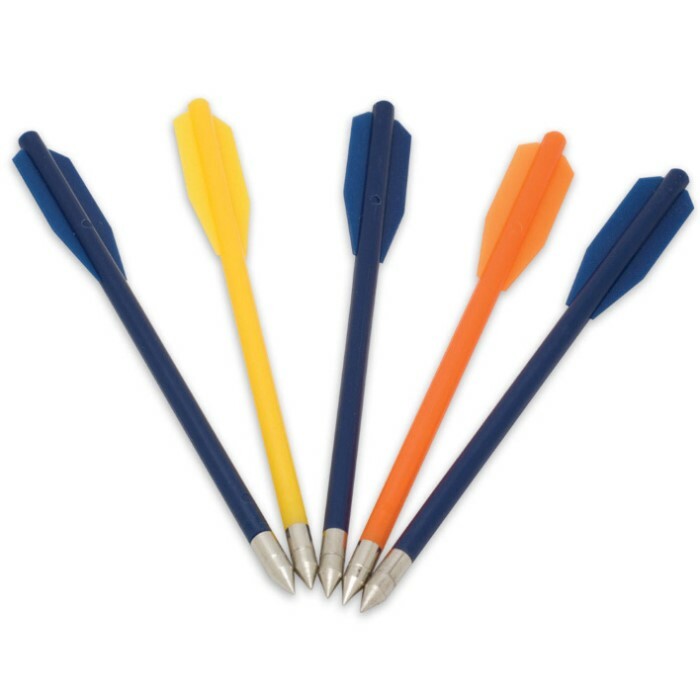 It also comes with five quality fiberglass bolts with field tips, draw string and a target to get you started right out of the box. I have been using this crossbow pistol for years with no problems other than screws coming loose. A little Locktite on the threads will fix that. It is also accurate. I have ruined several bolts by hitting ones already in the target (a Robin Hood). A cardboard box stuffed with old phone books or thick catalogs makes a nice back stop. My only complaint is that the trigger pull is very hard. If you plan to use this a lot, get some some extra bolts, a spare string, end caps, and some bowstring wax. This is an amazing value. Doesn't need to pull back strength also perfect for combat or shooting practice. Great accuracy for under 20 bucks! !! I bought mine a month ago and just finally got the chance to assemble it and try it out. This is the second pistol crossbow I have purchased, the result of the first one (being of another brand) bending as I tried to string it. I'm giving it only four stars as the instructions were not the clearest. After the trial and error with the first crossbow, I advise getting help stringing the crossbow, using one person's legs to press the bow into and let the person being used to lever the bow back to string it. A couple of the nuts used to hold the main assembly together were also loose, so make sure to check those. Now the nice thing is that the safety snaps on quite easily, making it much safer to load the bolts. All in all, a worthwhile buy for ten bucks. I have been using crossbow pistols like these for several years without a problem. My only complaint is that the trigger pull is hard. Wax the string often and put some locktite on the screws to keep them from loosing up, and you should get a lot of use out of it. The string will wear out eventually, so get a spare string and end caps for the limbs. Old phone books make great target backers. it is fun and very powerful but the strings break very easy. I've got approximately30 crossbows and crossbow pistols in my extensive collection of firearms, knives, swords, military surplus(past and present, any military vehicles. I purchase the least expensive. On BUDK for having family fun, target practice, and my beginner crossbow hunters. But how can an adult gives negative reviews on these items just because they don't add up to a Ten Point. These are quality products for such a low price, some might need a little work here and there but they don't cost $1200-$1800 like Ten Points crossbows either. Got it as a Christmas gift, it went together fine & shoots pretty good. It's a little powerful but it's fun! i have had this crossbow for 2 years and have had a lot of fun with it but after 1 two 5 hr of shooting the string well break every time, it is super easy to use.